Fredericton / Blog / 201903 / Top 7 Fredericton Breakfast Spots! Debbie Perry is a busy Mom of three humans and one canine. When not working in her day job with Fredericton Tourism, Debbie plots her next adventure that usually involves taking a path less travelled, with kids and dog in tow. “One of the best ways to explore is to get lost” says Debbie, who recently did just that when attempting to find a waterfall in the back woods of Nackawic with only her paper GPS in hand! Who knew that breakfast was such a hot topic? Frederictonians definitely know what they like when it comes to breakfast, and we would like to share some of the wisdom we’ve received from YOU! Here’s a list of some of our “fan favourites”! Doesn’t the name sounds delicious? Many instagrammers enjoy this resto that serves all day breakfast, with their specialty being, (you guessed it!) Belgian waffles! You’ll find Sweet Belgian Desire on 23 Ashton Court (off Hanwell Road, near Ritchie’s). Check out their menu! In the heart of downtown (649 Queen Street), Isaac’s Way boasts some unique menu items. If you are a vegan, enjoy the Tofu Scramble or The Avocado. As @erinnfeicht puts it: ”Love Isaacs Way eggs benedict the best! !” and on facebook, Kelly Davis writes: The smashed veggie from Isaac's Way Restaurant is unreal. That potato + hollandaise is soooo good. Highly recommend! If the temps are right, enjoy a leisurely breakfast on their outdoor patio! Check out their menu! 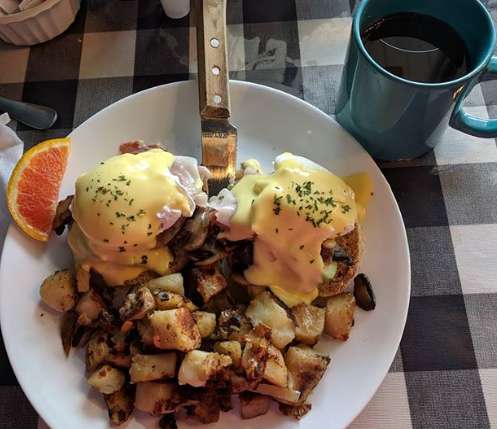 Well known for the varieties of eggs benedict like Shediac Lobster eggs benedict and buttermilk fried chicken and avocado eggs benedict, this eatery is definitely worth the visit! And while you’re there, sample some of their delicious pastries and to die for coffee. One of my personal favourites! Maybe it’s the quaint name, and the fact that it actually looks like a cabin or maybe it is the vintage mini jukeboxes on each table; either way, one thing is for sure: their food is pure comfort! Choose from the “Big Fella” or as Lyndsay Wark suggests, “The cabin’s chocolate chip pancakes”! You are guaranteed to walk away with a full belly and a smile! As Katie Pierce puts it, “Lunar Rogue has super great prices and as a bonus you can wash it down with a caesar! Choose a nice morning and have breakfast on their patio on King Street. Either way, you are in for a treat at this almost 40 year old establishment! A Fredericton staple, this busy spot serves up yummy items such as Breakfast wraps, smoothies and “skillets” (new!) that is essentially breakfast in a bowl, served with warm hollandaise sauce; add a nice hot cup of coffee and you’re set for the morning! Are you hungry yet? This list is by no means complete; where’s your favourite spot? Fredericton has a variety of breakfast spots that is sure to satisfy your morning cravings!